The brand new SMOK Replacement Coils are designed for TFV12 PRINCE Tank with intense clouds and accurate flavor. There are V12 Prince-Q4 0.4ohm, V12 Prince-X6 0.15ohm, V12 Prince-T10 0.12ohm and V12 Prince-M4 0.17ohm for your selection. 3pcs each pack. 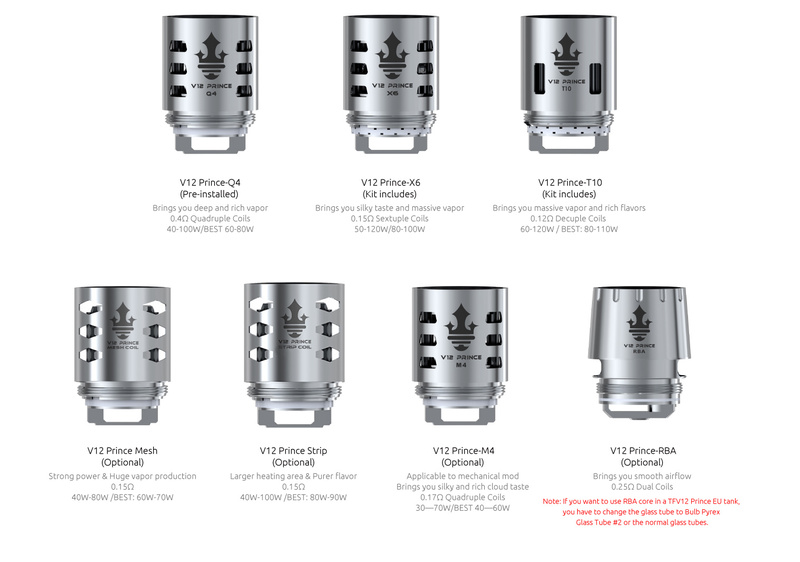 Just get them for your TFV12 PRINCE to enjoy happy vaping! TPD Version and Standard Version are available. The Innokin Zenith Coils are designed solely for use with the Innokin Zenith Vape Tank, co designed .. Aspire Triton Coils - 1.8ohm - 5 Pack Available in: 0.3ohm Coil : 316L Stainless Steel Wire (45-55W).. Rated 18-23 watts, the PockeX Atomizer has a 0.6Ω 316L stainless steel coil. The PockeX adopts U-Tec..
Smok Vape Pen Coils 5 Pack 0.25ohm..